Sometimes you need to undo a replacement you have made. On the Undo tab, you can find the replacement, view its parameters and press the Undo button. The replacements are sorted by date from newest to oldest. 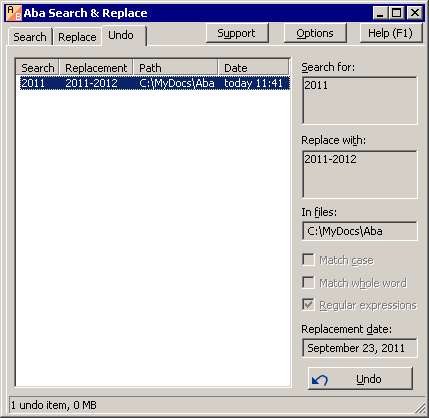 Aba makes a backup of your files when you replace some text in them. The backups take some space on your hard drive (shown in the status bar on the Undo tab). They are stored in the same directory as the ini file. The oldest undo items are deleted if the size of all items reaches the limit specified in Options. You can manually delete a backup (for example, for privacy reasons) by right-clicking it and choosing Delete from the context menu. There is also an option to delete all backups.